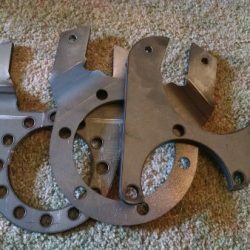 This kit includes hardware that you may need if you’re adding a set of disc brake calipers from a 1976-78 Cadillac Eldorado to your vehicle. 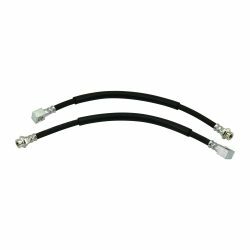 This kit includes the actuating lever, cable mount, return spring, and hardware need to mount emergency brake cables to rear calipers. One kit does both sides. NOTE: If you don’t already have your own 76-78 Eldorado calipers, than you don’t want this kit. You want our full emergency brake kit here, or one of our full disc brake conversion kits here. 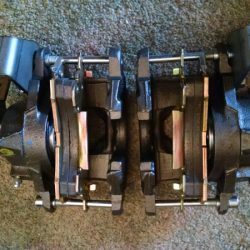 If you are converting the rear drum brakes on your truck over to disc brakes, you may lose your parking brake. If you go with option #2, than this emergency brake hardware kit is for you. 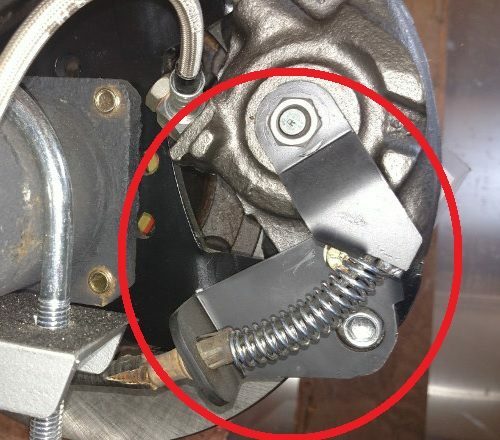 This is a hardware kit only, and it is for people who already have their calipers, but the parking brake actuator is damaged or missing. NOTE: This kit does not include brake calipers or the emergency brake cables that run from the brake to the pedal or hand lever.